Two volcanoes emerging from an emerald sea gave birth to the myth of paradise known today as the largest of the Polynesian islands with an area of 1,042 sq km (651 sq mi): steep cloud-draped mountains, deep verdant valleys, luxuriant ferns, swift, invigorating rivers and black sand beaches await you on this “island of love”. Tahiti Island is larger than all of its neighbouring Society Islands put together and takes about 6 hours to circumnavigate by car, Tahiti offers lovely coastal scenery, high mountains with tropical rain forests, and some of the best hiking and surfing in the South Pacific. Visit of Papenoo Valley, River bath, Waterfalls. Duration: approx. 7 hours (No meals included). Enjoy a hidden world of lakes, high cliffs, lush valleys and waterfalls, uninhabited since the arrival of western civilisation, 200 years ago. The expedition starts from the east coast before crossing the main crater in Papeeno Valley. You will discover all the lush vegetation of the interior of the island of Tahiti with its giant ferns, colourful plants and much more. You will see magnificent waterfalls, cross rivers and pure mountain streams and visit archaeological sites and the lake of Vaihiria. This Lake is known among locals for its large eels and nearby plantations of "fe'i" (mountain bananas). Make a stop for refreshments and a swim in a natural mountain pool before enjoying an excursion plate at La Maroto Restaurant (not included in the price of the tour) with a panoramic view on the Papenoo valley. You can take your own lunch with you, or order any meal at the Maroto restaurant where you'll stop at midday. Rendez-vous at 6:15 am at the dock, departure at 6:30am. You will board on a catamaran. After a quick breakfast you will take the sea at 6:30, to Tetiaroa. During navigation, you often encouter whales from July to October. This is a beautiful spectacle as the crew do not hesitate to linger to contemplate. Dolphins are often in the game all along the year. After arrival at 9am on island you start disembarqment in zodiac and the visit of the bird island (motu Manu). The guide will show you the different species of birds and the brown booby Red-footed Booby, Black-billed Tern and Crested Tern Yellow-billed, the Noddy and the great frigate. Departure is scheduled at 3 pm from Tetiaroa and arrival at Papeete around 5:30 p.m. Renew your vows in the blue waters of the Tahiti, Moorea and Bora Bora Lagoon! 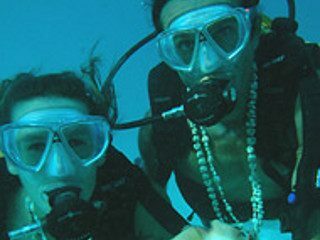 You may be on your honeymoon in Polynesia or on a romantic holiday for two ...what better way to surprise your loved one than with a romantic underwater interlude! Treasure the memories of your Polynesian holiday together with a private dive. You will discover a kaleidescope of underwater flora and marvel at an impressive display of marine life unique to Polynesia. To make the experience even more memorable and to up the fun factor, we propose your renewal of vows underwater, complete with undersea props that we can provide (just married sign) to catch all of it on camera. This private dive will be organized just for you and your loved one, accompanied by your own diving instructor and a videographer to capture your most memorable undersea moments on camera. And to toast the happy couple, you shall be welcomed by a refreshing after-dive fruit drink! Excursion includes : 2 introductory dives with a private instructor, shell leis, a refreshing after-dive fruit drink and your romantic dive recorded on DVD! 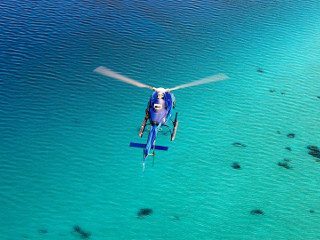 Helicopter Tour: 30min flight - In the heart of the island! Takeoff Airport Tahiti / Faa'a then head north to the west Papeete. Across the island to Papenoo: the valley of thousand waterfalls. The Valley of Maroto and its hotel-restaurant in altitude. Back by the lighthouse on the Cape of Venus and aerial view of Papeete. The route can vary depending on the weather, but the flight time is constant. Enjoy a unique and informal dinner or a memorable post-dinner dessert at Vai'ete Square. Here, dozens of colorful roulottes, or food wagons, host a great variety of island cuisine and desserts. The boardwalk atmosphere is an informal and lively setting not to be missed. Discover all the beauties of Tahiti island, at your rythm ! More than just an international point of arrival for the other fabulous nearby islands, Papeete, the capital of Tahiti, offers visitors numerous treasures: the colorful market, art and history museums, botanical and flower gardens, animated nightlife and cultural exhibitions such as the traditional “Heiva” (in July each year) which provides a lively change of scenery full of folklore, dancing, singing, colors and fragrances. The town has a distinct French flavour, there are exciting nightclubs, lovely cafes and the delightful nightly les roulettes takes over the waterfront car park overlooking the harbour where all types are food are cooked and served at make shift plastic tables. The huge traditional market, which is the main tourist interest, is located donwtown papeete and has a good selection of handicrafts from around the islands, perfumes, oils, flowers, island style clothes as well a few small restaurants upstairs serving fresh raw tuna. On the mountain side, the Fare Rau Hape road brings the visitor to the Belvédère restaurant, over 600m (1,700 ft) high in altitude, where the panoramic view of Papeete and its surroundings is breath-taking, with the island of Moorea in the background. This is the starting point for hikers to climb Mt. Aorai, a sport oriented excursion to over 2000 m (6,500 ft) in altitude, to truly discover the heart of the island. The north coast of Tahiti has the islands' best mountain scenery and a few noteworthy scenic attractions. Here too are several picturesque black sand beaches with excellent surfing, for example Papenoo’s waves, dear to surfers, mingle with the cold Papenoo river waters and the black sand of the beach. All along the road, you can stop to admire the boldness and dexterity of the local young surfers. The closest beach on the North Coast to Papeete is Point Venus, a stunning lookout over tranquil Matavai Bay which has excellent swimming (black sand beach) - you can sometimes spot dolphins in the water. 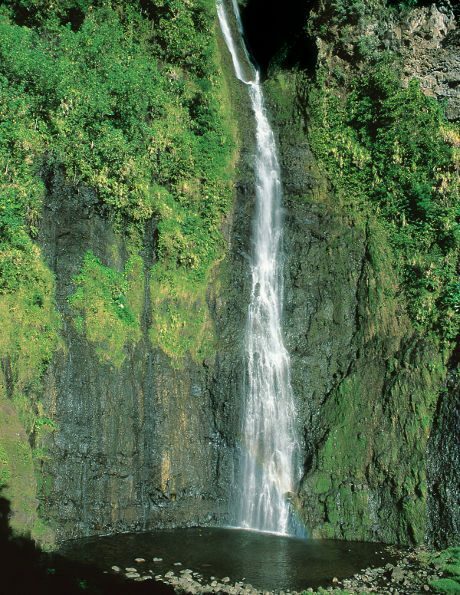 At Arahoho Blowhole a road leads a few km inland to the three waterfalls of Faarumai. It takes only a five-minte walk to go admire the first of these waterfalls. Nevertheless, it takes a good half hour and hiking boots to reach the other two waterfalls located at the bottom of the valley. But the detour is worth the view: an impressive hike amid luscious and wild nature. The trail is well maintained and the walk can be done without any difficulties. 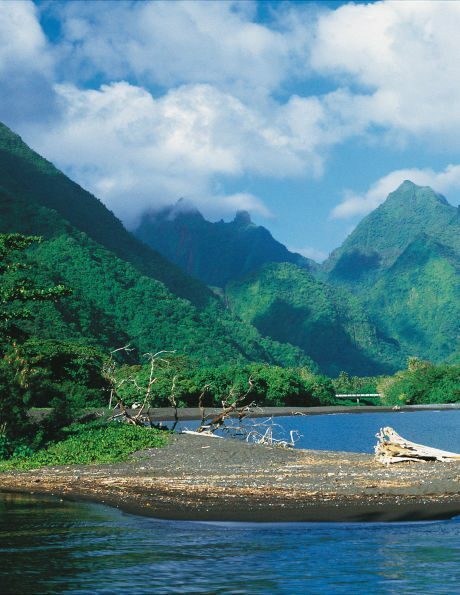 Twenty kilometres before reaching Papeete, the inland road from Papenoo offers lovely mountain scenery and is the venue for several 4WD day tours, walking tours and horse back excursions. Not far from the heart of Tahiti, in the middle of the mountains, the Relais de la Maroto invites you to take a leisurely break. You can even spend the night there, as the lodge has 20 rooms, and do not miss its incredible wine cellar, known all over Polynesia. If you follow the road you'll reach the East side of Tahiti, this part of the island have little tourism interests, except for the preserved authenticity and a charm that is not deprived of nostalgia. At the end of this picturesque road (and also at the South East end of the island) we'll find the village of Tautira which remains an authentic village, unlike those driven through all along the circle island road. The black sand beach at the entrance of the village is one of the most beautiful in Tahiti. You can swim there without danger, even though there is no reef in that spot. Staring from Papeete, you'll find almost next to it the international Airport of Tahiti Faa'a, and you'll have to drive few kilometers after to reach the most accessible beach on Tahiti which is along the south west coast at Punaauia where the fine white sand makes a picturesque setting looking down the coast and over to Moorea Island. At the northern end of the beach is the grand Le Meridien Hotel. Next to it you'll discover the beautiful land of Pointe des Pêcheurs, at PK 14.6, where you find the Museum of Tahiti and her Islands, essentially dedicated to Polynesian history and culture. Heading South, you'll arrive to the Maraa Grottos before reaching PAEA village. It is at PK 28.7, behind a well planned parking lot, bordered with well maintained gardens, that the Paroa underwater grotto, the largest grotto opens. It is said that there are half a dozen adjacent underwater grottos and many legends enchant the place. The gardens show an abundance of local plants pleasantly aligned in the alleys. Across the road, the lagoon, large et rich in fishes, offers a splendid panorama to its admirers. Going South again and you'll reach, just beyond the bustle of Paea Village, a beautifully reconstructed marae at Arahurahu, a must see, which makes for the spectacular setting for several cultural performances. 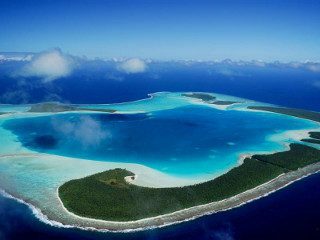 Slightly after the marae we'll find the golf course of Tahiti and just after it the town of Papara, and his large white sand beach, popular surfing spot, which is one of the privileged meeting place for the city youth. Be aware that swimming is possible, but relatively dangerous because of unexpected currents and stones moved around by the surf, which may cause some painful and durable bruises! Next Village will be Papeari, home of the Gauguin Museum and the Botanical Garden. The museum includes several rooms dedicated to the life of the famous painter. Only a very few of Paul Gauguin's original pieces are seen here, but the visitor will get acquainted with his life in Polynesia, the Polynesia he loved above everything else and helped him to sublimate his art. The Botanical Garden was create early in the 20th century by Harrison Smith, an American adventurer and an ecologist before its time. An impressive collection of tropical specimens are offered to the visitors, under the eyes of two Galapagos tortoises. A mandatory stop, rendered even more enticing by the nearby presence of one of the best gastronomic restaurant, the Gauguin Museum Restaurant. You'll then reach the peninsula's West Coast, where white sand beaches and magnificent scenery await you there. Even the islanders will seem different from those in the rest of the island. The local people "go down" to Papeete only once a year... Needless to say, nobody here has been contaminated by the "progress" virus. The circle island road comes to an end in Teahupoo, in the middle of flowery gardens. Off shore, for experienced surfing afficionados, the reef offers one of the best spots in the world with gigantic waves in some seasons. The road comes to an end here. Further, is the famous Pari coast, in the heart of the Fenua Aihere untouched and wonderful, only accessible by sea. Upon arrival, transport from Faa'a International Airport to your hotel or cruise ship is quick and will be easily arranged by your personal travel consultant at easyTahiti.com. To get around Papeete and the surrounding towns taxi service is available from your hotel and is best arranged by your hotel's concierge. Once in downtown Papeete, the waterfront, restaurants, and shopping are within walking distance. 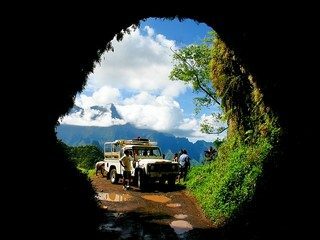 Escorted circle-island bus or 4x4 tours are the ideal way to explore the points of interest around Tahiti's coast and within the interior valleys. Car rentals are also available from the airport and your hotels. Other methods of exploring the island include motorboat and yacht charters, outrigger canoe tours of Matavai Bay, and helicopter tours-all of which can be arranged in advance or at the activity desk of your resort or cruise ship. Connecting flights to other islands on Air Tahiti leaves from Faa'a Airport. Passenger ferries to Moorea depart from the waterfront in downtown Papeete. Due the lack of flights between the island of Tahiti and the island of Moorea, the ferry is the most used option to reach Moorea (around 10 departures each day, affordable prices). 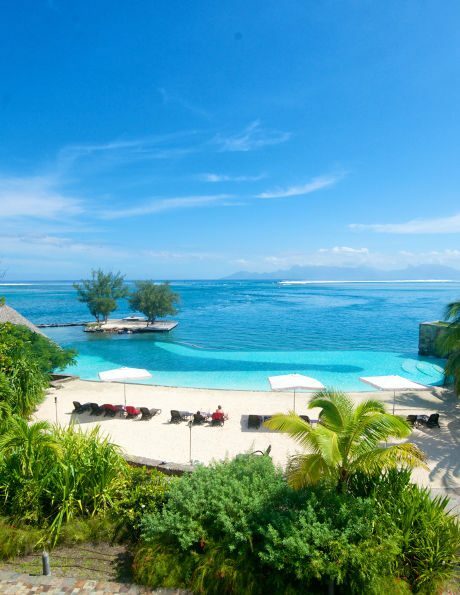 Tahiti offers a world of adventure for families and for children of all ages! Whether here for a day or a week, the urban and island environment provides a unique blend of accommodations and activities designed for family fun and enrichment. - Large swimming pools - many with sand bottoms- at the resorts with fountains and waterfalls. - White and black sand beaches with calm and shallow snorkeling. - Family-sized 4X4 excursion vehicles for half-and full-day expeditions into the lush interior for exploration and a picnic under a waterfall. - Guided hiking and boating excursions with a naturalist who provides a close up study of the bird, plant, and marine life. - Tours of the museums and points-of-interest around the island with exhibits of interest for the whole family about geology, art, history, and exploration. - Regular performances of music, sport, and dance featuring local children. - Nightly outings to the Papeete waterfront where the roulottes offer a fun way to enjoy food and dessert along with local families and their children. Health: 2 hospitals, 2 private clinics, 12 dispensaries, 1 infirmary.